From its headwaters high in California’s Sierra Nevada, the Truckee River flows into and through Lake Tahoe, continuing down the Truckee River canyon to the Reno metropolitan area and then across miles of Nevada high desert before flowing into Pyramid Lake, 40 miles northeast of Reno. Voters in Washoe County appeared to reject WC-1, the countywide measure to fund flood control projects along the Truckee River. With 58 percent of votes counted, the measure was losing 32 percent to 68 percent. Nevada taxpayers will help technology giants such as Tesla and Google pay for a 13-mile pipeline that will carry water to an industrial park in Storey County. … “The Truckee River has been one of the most adjudicated rivers in the Western United States,” said former Southern Nevada Water Authority and Las Vegas Valley Water District General Manager Patricia Mulroy, a consultant on the pipeline project. The situation on the Truckee River is similar to the one facing many water managers across the West. In recent years, warming temperatures and changes to precipitation have started to affect the way snowpack falls, when it melts and how it runs off into a river system like the Truckee, the lifeblood for farmers and cities in an area that is arid and is expected to become more so. City personnel have removed a group of homeless encampments along the Upper Truckee River. The abandoned homeless camps, which according to the city consisted of trash and other debris, were located in the Truckee River Meadow area behind Motel 6. 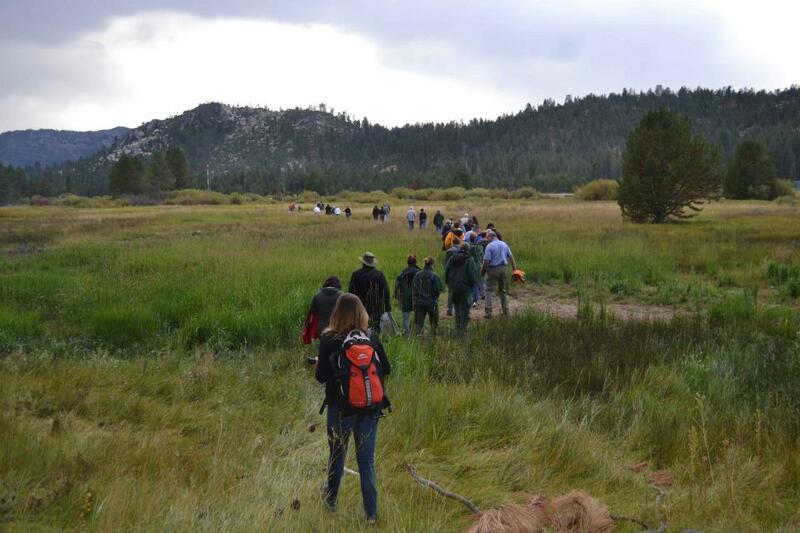 After a November court ruling resulted in California State Parks compromising restoration plans for the Upper Truckee River at Washoe Meadows State Park and Lake Valley State Recreation Area, the department has developed a new alternative and is seeking public comment until the end of this month. With Floriston rates, or rate of flow on the Truckee River at Floriston, meeting the required mean flow of 500 cubic feet per second, and Lake Tahoe’s elevation below the maximum of 6,229.10 feet, the Lake Tahoe Dam remained closed until last week, which forced the two [rafting] companies off the water. 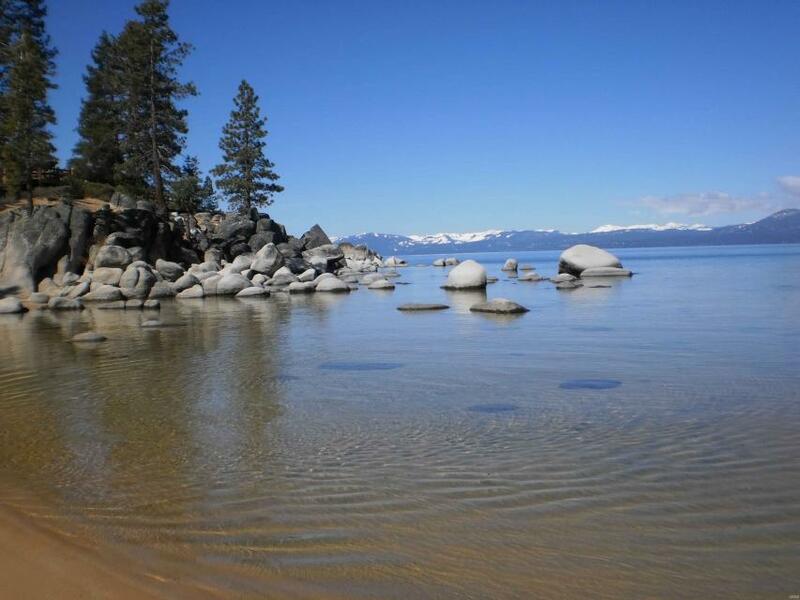 Lake Tahoe’s elevation was measured at 6,228.95 on June 26, according to the Water Master’s daily report, with the flow rate at Farad measured at 591 cubic feet per second. Lake Tahoe, the iconic high Sierra water body that straddles California and Nevada, has sat for more than 10,000 years at the heart of the Washoe tribe’s territory. In fact, the name Tahoe came from the tribal word dá’aw, meaning lake. The lake’s English name was the source of debate for about 100 years after it was first “discovered” in 1844 by people of European descent when Gen. John C. Fremont’s expedition made its way into the region. Not long after, a man who carried mail on snowshoes from Placerville to Nevada City named it Lake Bigler in honor of John Bigler, who served as California’s third governor. But because Bigler was an ardent secessionist, the federal Interior Department during the Civil War introduced the name Tahoe in 1862. Meanwhile, California kept it as Lake Bigler and didn’t officially recognize the name as Lake Tahoe until 1945. Tahoe Resource Conservation District is three years into a long-term aquatic invasive species eradication project on the Truckee River — and the progress is encouraging. TRCD is working to eliminate Eurasian watermilfoil from a 3-mile stretch of the Truckee River, starting above the Tahoe City dam and continuing down to Alpine Meadows Road. The Tahoe Reno Industrial Center, or TRIC, sprawls across 107,000 acres of Storey County, a wedge of desert mountains and plains just east of the Reno metropolitan area. … It’s a modern-day land rush that begs an important question: Where will all the water come from to serve these corporate ambitions? 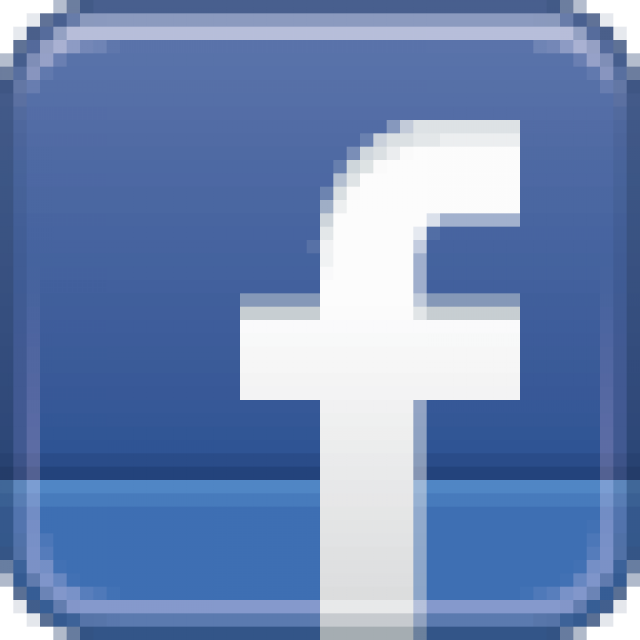 Tahoe City’s two rafting companies, Truckee River Rafting and Truckee River Raft Co., are back in action after receiving the call late on Thursday, Aug. 3, from Federal Water Master Chad Blanchard that water would again be released from the Lake Tahoe Dam. As of Tuesday afternoon, lake level was at 6,228.18 feet, just .92 inches from Lake Tahoe’s legal limit of 6,229.1 feet. The Upper Truckee River was just shy of 8 ½ feet — about 2 feet from flood stage. The state of Nevada will pay $120,000 to settle a U.S. Environmental Protection Agency complaint about storm water runoff pollution in Reno. For the first time in 18 months, the Truckee River has begun flowing after Lake Tahoe’s water level reached a milestone. Here at the Gatekeepers Museum, onlookers see something that until now has been a rare occurrences. Lake Tahoe at its natural rim, slightly above as a matter of fact, to allow water to overflow into tributaries — like the Truckee River. A new federal study takes an in-depth look at how climate change will affect the Truckee River Basin. The Basin includes the Truckee and Carson Rivers, Pyramid Lake and Lake Tahoe. There will be more water available to supply the Truckee River this summer. After more than a quarter decade of uncertainty, litigation and deal making, officials announced Tuesday the Truckee River Operating Agreement is finally in effect. Biologists from the U.S. Forest Service are moving thousands of Western Pearl Mussels in the Tahoe Basin. Decades of efforts pursuing a major overhaul in the way waters of the Truckee River are managed reached a milestone Wednesday when regional water officials agreed to a deal they said should allow the plan to be operating by 2016. In a further sign of a drought of historic intensity, flow from a diminished Boca Reservoir into the Truckee River halted Thursday. 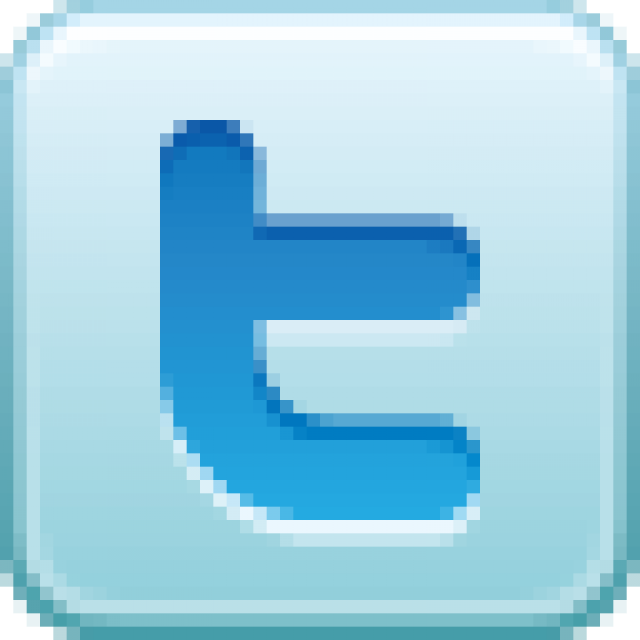 … The Truckee River Basin’s snowpack Thursday was measured at 15 percent of normal for this time of year. The Carson River Basin’s was at 1 percent. For the second year in a row, Nevada wildlife officials are releasing thousands of trout in the Truckee River a month earlier than usual to give them a fighting chance to survive in the cold mountain waters where they’ve spawned for centuries but face increasing threats from drought. Lingering drought has helped push Lake Tahoe’s water level below its natural rim for the first time in five years, cutting off flows into the Truckee River, which has been reduced to a shallow stream as it meanders down the Sierra through Reno. 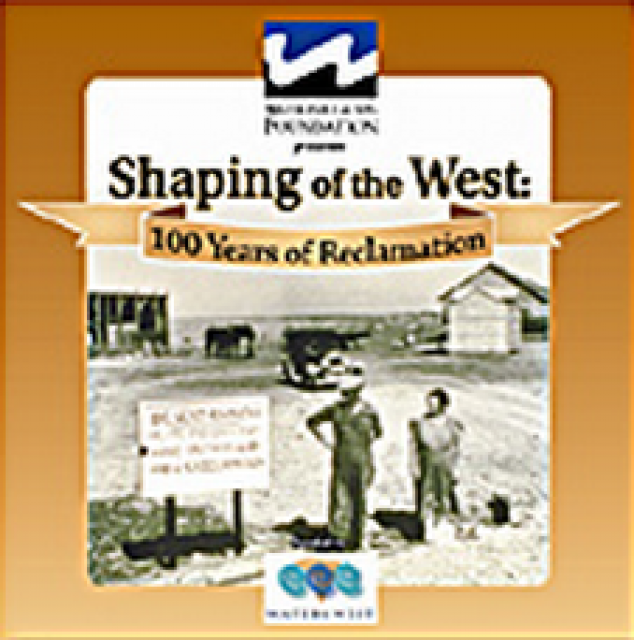 30-minute DVD that traces the history of the U.S. Bureau of Reclamation and its role in the development of the West. 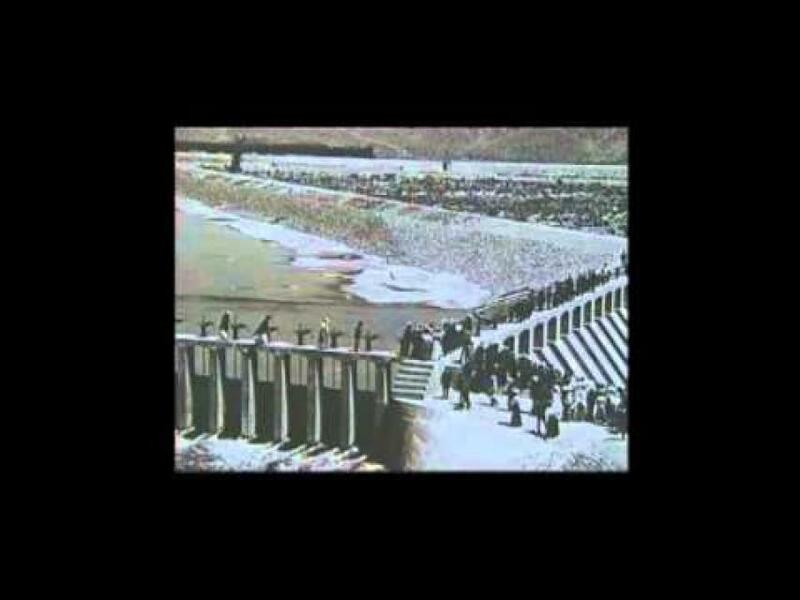 Includes extensive historic footage of farming and the construction of dams and other water projects, and discusses historic and modern day issues. 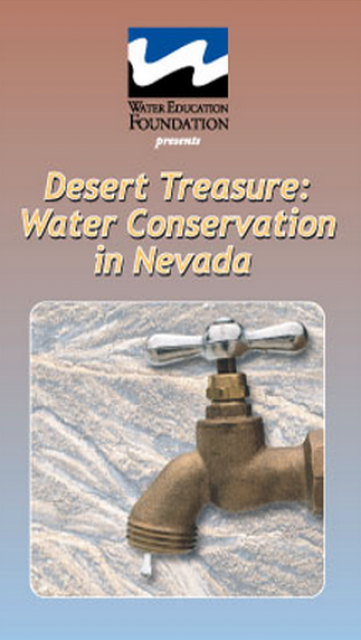 With an average annual rainfall of only 9 inches, water conservation in Nevada is essential not only in drought years, but every year. 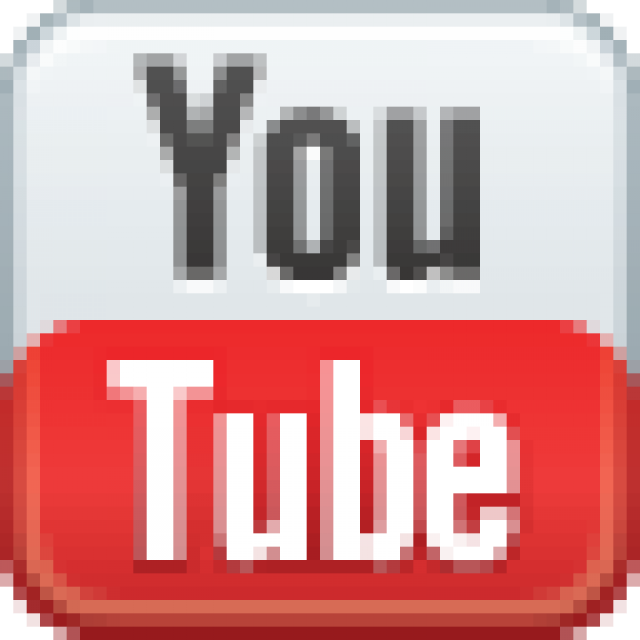 This 17-minute video features interviews with key policy-makers who explain how important it is to develop a conservation ethic for this desert state. 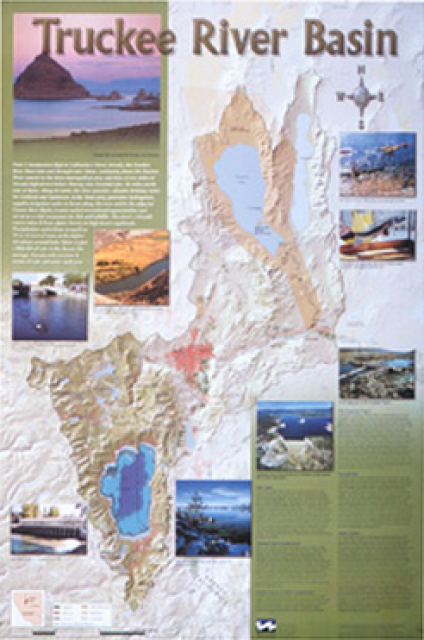 This beautiful 24×36 inch poster, suitable for framing, displays the rivers, lakes and reservoirs, irrigated farmland, urban areas and Indian reservations within the Truckee River Basin, including the Newlands Project, Pyramid Lake and Lake Tahoe. 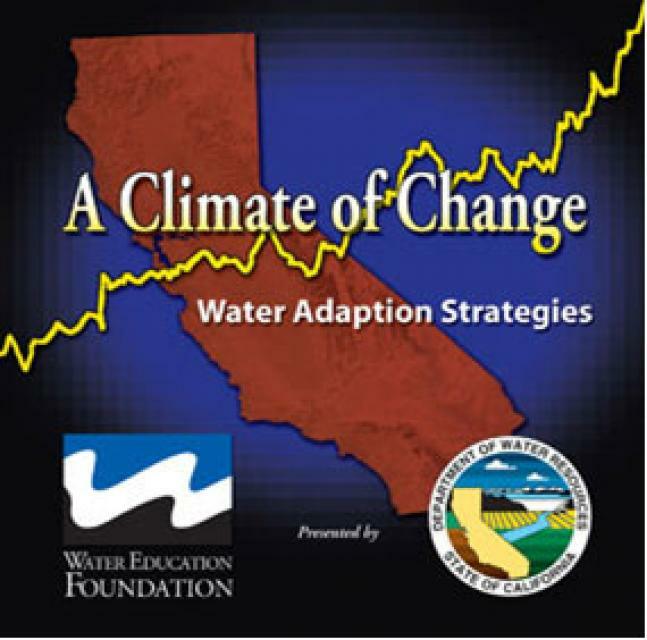 Map text explains the issues surrounding the use of the Truckee-Carson rivers, Lake Tahoe water quality improvement efforts, fishery restoration and the effort to reach compromise solutions to many of these issues. 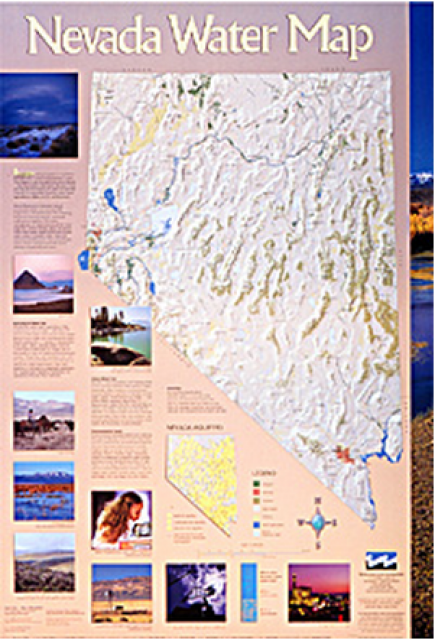 This 24×36 inch poster, suitable for framing, illustrates the water resources available for Nevada cities, agriculture and the environment. 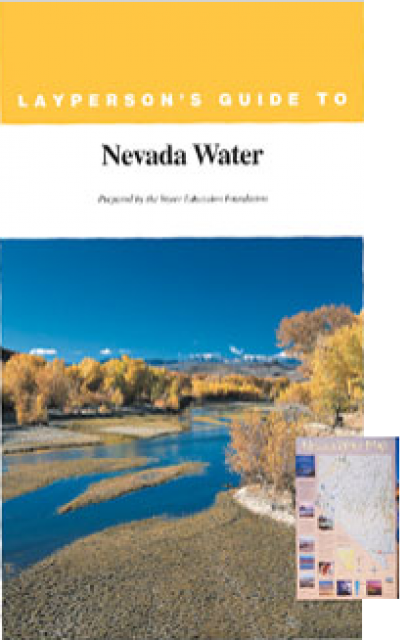 It features natural and manmade water resources throughout the state, including the Truckee and Carson rivers, Lake Tahoe, Pyramid Lake and the course of the Colorado River that forms the state’s eastern boundary. From it headwaters high in California’s Sierra Nevada, the Truckee River flows into and through Lake Tahoe, continuing down the Truckee River canyon to the Reno metropolitan area and then across miles of Nevada high desert before flowing into Pyramid Lake, 40 miles northeast of Reno. 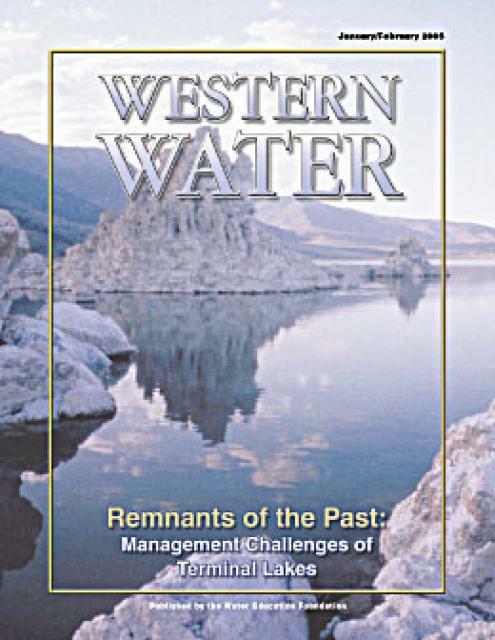 This issue of Western Water examines the challenges facing state, federal and tribal officials and other stakeholders as they work to manage terminal lakes. 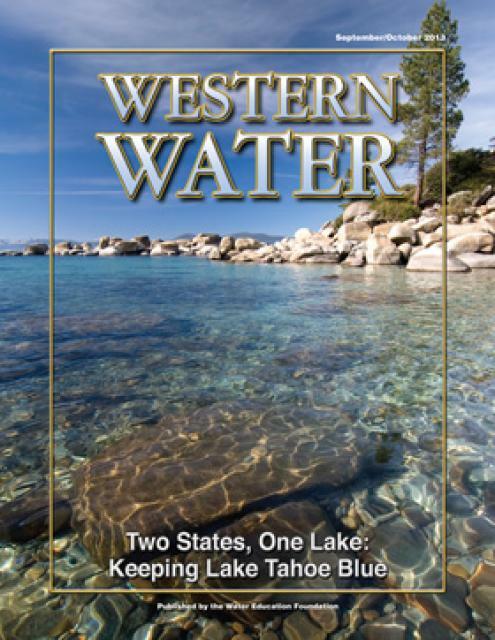 It includes background information on the formation of these lakes, and overviews of the water quality, habitat and political issues surrounding these distinctive bodies of water. Much of the information in this article originated at the September 2004 StateManagement Issues at Terminal Water Bodies/Closed Basins conference.